UFC heavyweight champion Daniel Cormier has been angling for a super fight with former heavyweight champ and long-time WWE star Brock Lesnar for some time. Not everybody, however, is a fan of this potential matchup. In fact, some fans outright hate the idea, adamant that Brock Lesnar doesn’t deserve a title shot, and that Daniel Cormier should instead defend his title against a more legitimate heavyweight contender. “The Cormier-Lesnar rumors weren’t true, that I had something done. That was never true. I’ve been talking about that’s the fight that Cormier wants,” White said at the UFC 236 post fight press conference (transcript via MMA Weekly). “I saw a lot of people giving Cormier s—t on the internet cause he wants that fight. 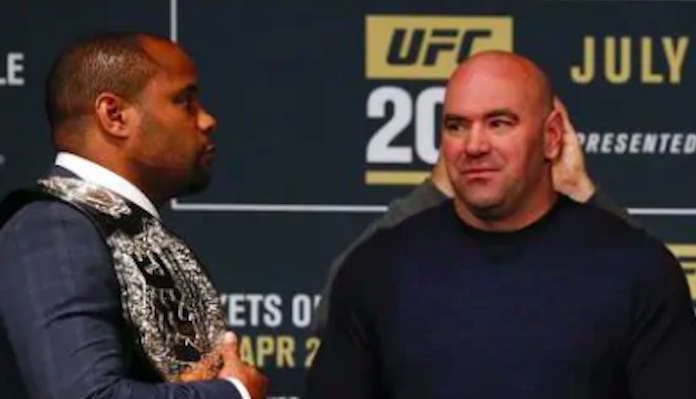 Dana White continued, explaining that Daniel Cormier will also probably rematch Stipe Miocic and Jon Jones before he retires — which makes it even harder to deny him his desired fight with Lesnar. “He’s still got two [other] nasty fights before he retires,” White said. “He’s got Jon Jones and he’s got Stipe Miocic. If the guy wants to fight Brock Lesnar, he’s going to fight Brock Lesnar if I can get it done and if I can make it happen. What do you think of a potential fight between Daniel Cormier and Brock Lesnar?